Despite higher than normal surface temperatures and heat contents of ocean waters where the storms developed, evidence is lacking that global warming is revving them up. 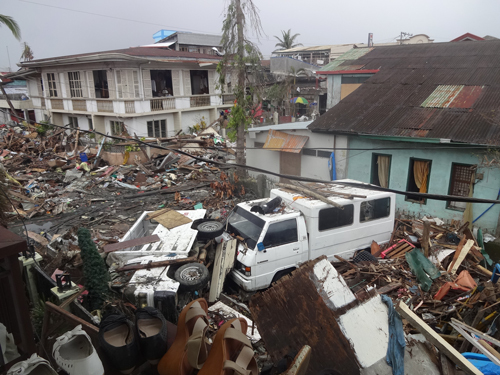 Typhoon Meranti blasted the western Pacific in 2016, wreaking havoc in the Philippines, Taiwan, and mainland China, leaving dozens dead or missing and doing billions of dollars’ worth of damage. Meranti is among some unusually ferocious Pacific storms in the past few years that seem to be in a category of their own, according to researchers who recently presented data quantifying such storms’ extraordinary power and conditions of formation. On top of bringing heavy rainfall and storm surges, the intensity of these recent tempests goes so far beyond what was previously thought to be the peak range of cyclone power that the researchers argued that they require a new level, a category 6, on a widely used rating scale for hurricanes and typhoons. “I think it is fair to give the public more accurate information, and it’s not fair to equate these two storms of the same category because the kinetic energy is doubling,” I-I Lin, a professor in National Taiwan University’s Department of Atmospheric Sciences, told attendees at a joint conference of the Japan Geoscience Union and the American Geophysical Union (JpGU-AGU 2017) in Chiba, outside Tokyo, in May. Herbert Saffir and Robert Simpson introduced their five-grade sustained wind intensity scale in the early 1970s. It ranges from category 1, for storms with winds of 64 to 82 knots (118 to 152 kilometers per hour (kph)), which usually cause only moderate damage, to category 5, for storms with winds blowing at 137 knots (254 kph) or above, which can cause widespread devastation. The researchers also tracked how storms Meranti and Haiyan and the 2015 storm Patricia, with top wind speeds of 185 knots, grew in intensity as well as danger. Meranti, however, had a peak intensity of 165 knots (306 kph), which made it the most powerful tropical cyclone in the world in 2016. It followed the 2013 typhoon Haiyan, which peaked at 170 knots (315 kph) and left more than 6000 dead. Lin and her collaborators calculated air-sea fluxes, which include moisture and wind exchanges, to understand how the storms became unusually powerful. The researchers also tracked how storms Meranti and Haiyan and the 2015 storm Patricia, with top wind speeds of 185 knots, grew in intensity as well as danger. Lin’s group determined the cubes of the storms’ maximum wind speeds, taken at 6-hour intervals and integrated over the storms’ lifetimes, to obtain each storm’s power dissipation index, a measure of the storm’s destructive potential. The scientists also calculated the squares of the storms’ maximum wind speeds to obtain the accumulated cyclone energy for each storm. This approximated each storm’s kinetic energy, Lin said, because the analysis took into account wind velocities around the center of the storm but not those that were vertical or in the directions toward or away from each storm’s center. When comparing a category 5 and a category 6 tropical cyclone of the same duration, given the difference in their intensity characterized by maximum wind speed, the kinetic energy of the category 6 storm of 165 to 185 knots would be 139%–175% higher than the category 5 storm of 140 knots, Lin said. Extraordinarily strong storms seem to be occurring more in recent years not only in the western Pacific but also in the eastern part of that ocean, Lin noted. The reasons for the surge in exceptionally fierce storms remain murky. To explore ocean heat content trends and to obtain sea surface temperatures and subsurface heat content estimates, all of which might contribute to the storms’ formation and ferocity, she and her collaborators analyzed about 3 decades of satellite data. They found that the spawning of Haiyan, Patricia, and Meranti was associated with toasty sea surface temperatures of about 30°C, 1°C–3°C warmer than normal, and subsurface heat content conditions of about 110–130 kilojoules per square centimeter, roughly 20%–30% higher than normal for those ocean waters. The reasons for the surge in exceptionally fierce storms remain murky, said Lin. Higher ocean temperatures from global warming have been proposed, but in 2014, she and colleagues published a paper in Geophysical Research Letters in which they suggested that Haiyan formed during a hiatus in warming. The hiatus was associated with La Niña, the cooling counterpart to El Niño. “Whether global warming has any contribution is still unknown,” Lin said in an interview with Eos. She said that long-term, decadal La Niña–like conditions are the likely reason for the increase in heat content fueling storms over the western Pacific such as Haiyan and Meranti. Even though La Niña produces an overall cooling effect over the eastern Pacific, the associated strengthening of the subtropical high-pressure system and trade winds causes warm water to accumulate more in the western Pacific. Lin had previous experience observing another supertyphoon, dubbed Megi. That was in 2010, when the researcher was in charge of the satellite component of a U.S.-Taiwan field campaign called “Impact of Typhoons on the Ocean in the Pacific” that took storm-related readings by aircraft, ship, buoy, and satellite. She said her presentation was based, in part, on research accepted in the Journal of Geophysical Research: Oceans and Bulletin of the American Meteorological Society (BAMS) State of the Climate, an annual supplement to BAMS issued each August. Although the Saffir-Simpson scale ranks the potential danger of storms, it leaves out factors such as how much surface area a storm covers, the storm’s precipitation, and its kinetic energy. For years, people inside and outside the scientific community have called for a category 6 to designate the most powerful storms, but not everyone agrees. In a 1991 interview, Simpson said higher categories for storms would be “immaterial” because damage is already devastating. Another presenter at the session, Paul Chang, a project scientist who studies satellite ocean surface wind data at the National Oceanic and Atmospheric Administration’s Center for Weather and Climate Prediction in College Park, Md., said that the current method that is largely used by U.S. scientists in this area of research, known as the Dvorak technique, employs satellite imagery to estimate tropical cyclone intensity but is imprecise and subjective. He added that researchers lack satellite tools that can systematically measure tropical cyclone intensity. Citation: Hornyak, T. (2017), Probing the power of Pacific supertyphoons, Eos, 98, https://doi.org/10.1029/2017EO077563. Published on 10 July 2017.